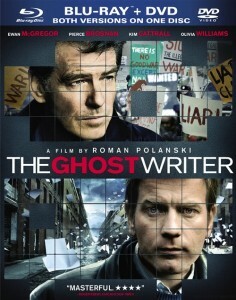 Unlike Roman Polanksi’s other thrillers, The Ghost Writer is political. But as with his other films, his latest once again forces us to look through windows, figuratively and literally, over the shoulder of a protagonist with whom we are made to identify. The Ghost Writer’s story is rich and complex, though not wholly satisfying. It’s Polanski’s sheer craftsmanship — which has grown more formal and classically constructed in recent years, but no less powerful — that’s most effective here. His angles, editing, pace, direction of actors — his filmmaking — puts the audience where he wants us to be, seeing and revealing what he wants us to see, plot twists, red herrings and idiosyncratic characters by damed. The storytelling and filmmaking is so pure, and that’s where the value is. Watching Polanski’s collaboration with Harris, I thought of Hitchcock’s work with scenarist John Michael Hayes on the 1956 version of The Man Who Knew Too Much: polished, precise, sophisticated. The cast is top-notch. McGregor is appropriately mystified and appealing as the ghost, while Pierce Brosnan’s Tony Blair-ish take as the charismatic former PM is the best work he has ever done. Ditto for Olivia Williams as his Cherie Booth-like wife, Tom Wilkinson and Robert Pugh as political power players, 94-year-old Eli Wallach as a Martha’s Vineyard beach hermit and even Kim Cattrall as Lang’s adoring, hard-as-nails personal assistant. Laurent Bouzereau’s supplemental 30-minute documentary is divided into three featurettes. The most engaging is Polanski’s segment, which, though billed as an “interview,” simply finds him talking about the production and his view on his oeuvre. 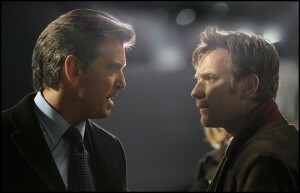 why wasnt this released in a r-rated version where they didnt dub over the four letter words. weird.